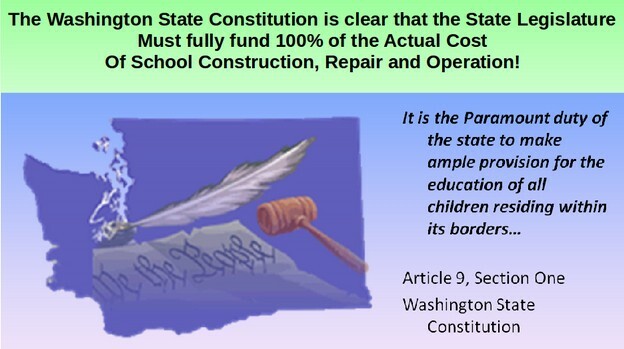 While a great deal has been written about the failure of the Washington State legislature to fully fund the operation of public schools, fully funding school construction and repair is by far the greatest need being ignored by our state legislature. Washington State is near the bottom of the nation in school operation funding as a percent of state income - which is why class sizes in Washington state are near the highest in the nation. It would take about $3 billion per year in additional state revenue just to restore school funding and lower class sizes in our state down to the national average. However, the shortfall in school construction and repair spending is now more than $50 billion – almost 20 times greater than the shortfall in school operation spending. As a consequence, Washington state has one of the highest rates of “unhoused students” in the nation. Restoring school operation and construction funding must both be done at the same time. It does no good to hire 10,000 additional teachers to lower class sizes down to the national average unless we also build 10,000 additional classrooms for those teachers and their students to learn in. 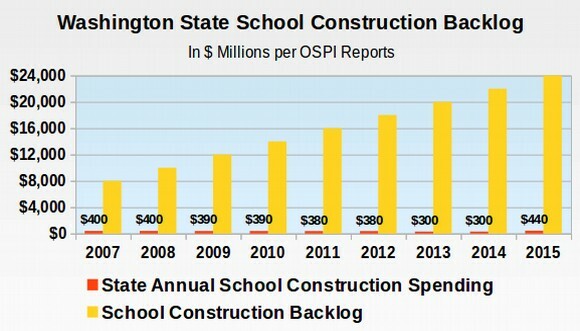 In this article, we will show that the Washington State legislature has underestimated school construction and repair costs by more than $2 billion per year – for more than 25 years – leading to a school construction and repair backlog of more than $50 billion. We will then present a plan to create a public bank in order to build these urgently needed public schools while saving State tax payers billions of dollars in interest costs that would otherwise be diverted to Wall Street banks. Our proposal is to invest $5 billion per year over a 10 year period – and pay for the increase in school construction and operation funding by repealing a tax break now used by billionaires to avoid paying their fair share of state taxes. Some in the State legislature claim that it is up to local homeowners to pass bonds to build public schools – that the State legislature is only responsible for hiring teachers. However, our Supreme Court has repeatedly stated that the legislature must be 100% of the actual cost to build, repair and operate our public schools. For more than two decades, our legislature has refuses to pay more than a small fraction of the actual cost of building and repairing schools. 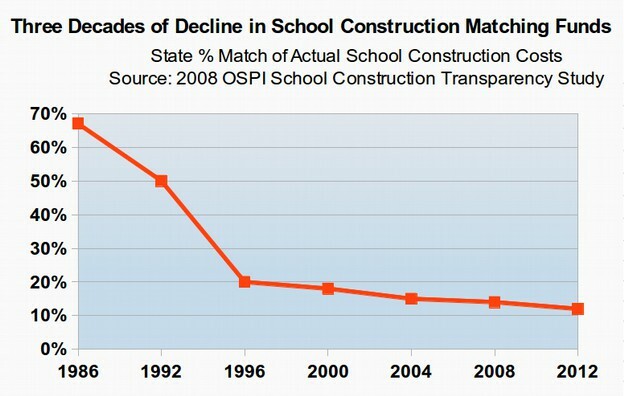 Whereas our State legislature historically provided more than 66% of the actual construction costs of public schools, State funding for school construction has fallen to below 10% of actual costs during the past 20 years. We will need to hire 10,000 additional teachers to lower class sizes down to the national average. Obviously, this will require building 10,000 additional classrooms. Sadly, not only has our legislature failed to provide adequate funds for operating schools, but they have also failed to supply funds for the repair and building of schools. Instead, the Washington state legislature shifted the responsibility for building and repairing schools onto the backs of local homeowners. 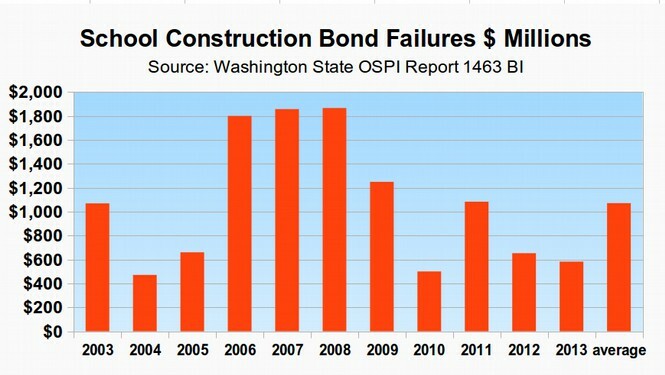 This led to more than 11 billion dollars in school bond failures during the past 11 years. The decline in State Matching funds has resulted in a transfer of this funding burden from the State to local home owners via an increasing dependence on local school construction bonds. Like with operating costs, the State’s failure to help fund school construction has led to a dramatic increase in local school bond and levy costs which in turn have led to a rapid rise in local property taxes. 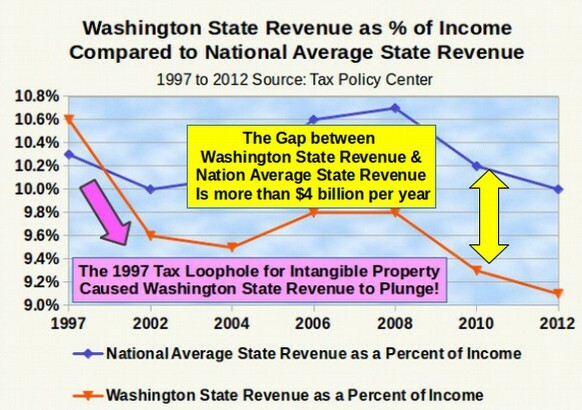 In January 2012, the Washington State Supreme Court ruled that the State legislature had failed to adequately fund our public schools. The Supreme Court gave the State legislature 6 years – until 2018 - to comply with our State Constitution. Sadly, our State legislature ignored this Supreme Court order during the 2012, 2013 and 2014 legislative sessions. In September 2014, the Supreme Court found the State Legislature in Contempt of Court for failing to make steady progress towards fully funding public schools. In 2015, the State legislature again failed to make steady progress towards fully funding public schools. Therefore in August, 2015, the Washington Supreme Court sanctioned the State legislature by assessing fines for failure to fully fund our public schools. Despite these sanctions, the legislature continues to ignore their constitutional obligation to fully fund school construction, repair and operation. The legislature claims that they do not have the money. Some in the legislature are currently going around the state on a listening tour to solicit ideas for how to come up with several additional billion dollars per year in order to fully fund our public schools. But everyone in Olympia knows where the money went that used to be invested in our public schools. In the 1980s, our State was 11th in the nation in school funding. However, since then, as the following charts show, tax breaks for billionaires and wealthy multinational corporations have skyrocketed to more than $30 billion per year – at the same time that state revenue and school operation funding have plunged to near the lowest in the nation. We propose rolling back these tax breaks for the rich by 20% in order to restore school operation and construction funding. You can see that tax breaks for the wealthy are about four times greater than school funding for our state's one million school children. 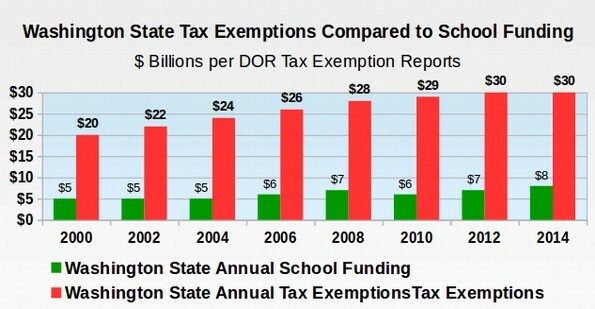 Since 2000, tax exemptions have increased by $10 billion from $20 to $30 billion while school funding has increased by $3 billion from $5 to $8 billion. We propose reducing tax exemptions by 20% or $6 billion per year - rolling them back to what they were in 2004 – so that we can increase school construction and operation funding by $6 billion per year. The sharp decline in school funding is closely related to state income which has also declined sharply due to the rapid rise in tax exemptions since 1997. While there are more than 600 tax loopholes for the wealthy, we propose eliminating just one of them – the biggest tax break which is a 1997 tax loophole exempting the intangible property of the wealthy from our state property tax. We believe that it is more important that our kids have safe schools to go to than that billionaires have money to buy bigger boats. This will not harm billionaires as they can deduct their state taxes from their federal taxes. So our proposal is really a several billion dollar transfer from the federal tax rolls to the state tax rolls. #1 Failure to build Permanent School Building – leading to an unhoused student rate of 10% - among the highest in the nation and double the national average. Over half of the schools in Washington state are more than 50 years old. These are the schools that do not meet the health code or the earthquake code. There are more than 2000 schools in Washington state. So there are more than 1000 schools that are dangerous and need to be replaced. We will now take a look at how much each of these problems will cost to get fixed. The only good news is that when we fix problem #6, we will also fix problem #5. Performance Audit Report 1000013 Page 21. 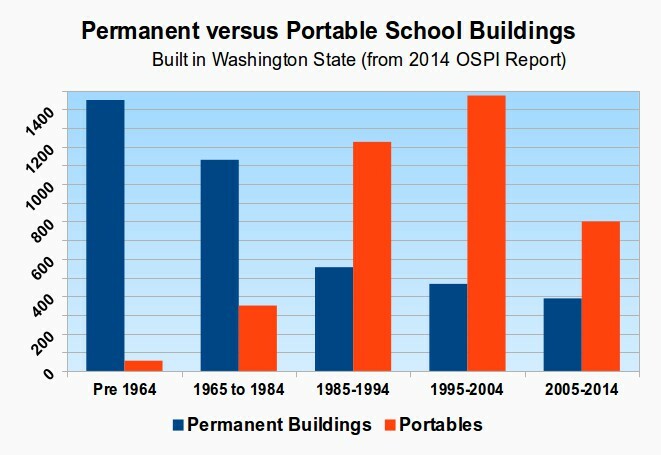 Despite the huge long term cost of portables, the number of permanent school buildings has plunged while the number of portable school buildings has skyrocketed. Fewer permanent classrooms were built in 2005 to 2014 than at any point in the past 30 years. Currently for every permanent new school building in our state, there are two to three temporary particle board boxes added to our schools. These boxes may cost a little less initially. But they cost much more over the long run and are not good learning environments for our students. These temporary buildings are not only very expensive in the long run, but they also cause health problems in students and teachers. According to the 2008 Auditor report, one in ten of our children – or more than 100,000 children in our State - are attending school in inefficient and unhealthy particle board boxes.This unhoused student rate of 10% is double the national average which is only 5%. As a consequence the average age of permanent school buildings in Washington state is now more than 50 years old! At 500 students per school, we would need to build 167 more schools just to address the 100,000 un-housed student problem in our state. The actual cost of each school is currently about $20 million for an elementary school, $40 million for a middle school and $80 million for a high school. We will assume that one half of the unhoused students attend elementary school, one quarter attend middle school and one quarter attend high school. The total cost of building 167 additional schools would be about $5.6 billion. Washington state is moving from half day to full day Kindergarten in the next two years. This is the equivalent of increasing Kindergarten students from 40,000 to 80,000 students. Yet with classrooms already exploding at the seams, there are no classrooms available for these additional 40,000 students. At 500 students per school, it would take building 1600 additional classrooms or 80 additional elementary schools. 80 schools times $20 million per school would require $1.6 billion. True to their pattern of only providing a small fraction of the actual cost, the legislature has proposed providing only $280 million or less than $200,000 per classroom – less than one fifth the actual cost! Another change scheduled for the next three years is reducing class sizes 320,000 students in Grades K through 3 from the current 24 students to 17 students. This will require not only hiring another 5,400 teachers but also building another 5,400 classrooms. At 27 classrooms per new school, this is another 200 elementary schools. Multiple 200 more schools times $20 million per school and the total cost is $4 billion dollars. The capital budget bill, House Bill 115, had $4 billion in funding. 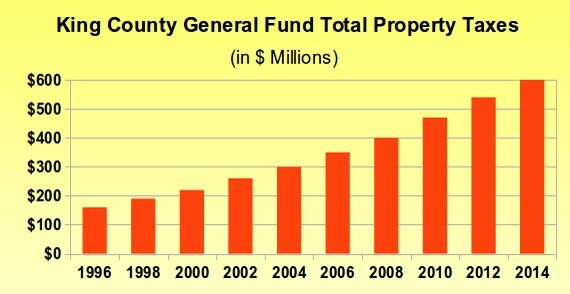 However, only one tenth of this or $400 million was for public schools. This was only $200 million per year or $200 per student. One of the excuses used to delay Initiative 1351 for four more years was the claim that there are not enough classrooms to support smaller class sizes and it will take years to build all of the classrooms. But while Initiative 1351 was delayed five more years until the 2020 -2021 school year, nothing was done to actually build the classrooms! The average class size in Grades 4 through 12 in Washington state is more than 30 students versus a national average of less than 27 students. Initiative 1351 approved by the voters in 2014 mandates lowering class sizes in Grades 4 through 12 to 25 students. 8 Grades times a grade cohort of 80,000 students is 640,000 students. It would take another 5000 teachers and another 200 schools to lower class sizes down to 25 students for these grades. But middle schools cost $40 million each and high schools cost $80 million each. So we would need $4 billion for 100 middle schools and $8 billion for 100 high schools. The total is $12 billion. Add $12 billion to $4 billion for K3 classrooms plus $1.6 for full day kindergarten plus $5.6 for 100,000 unhoused students comes to $23.2 billion. #5 Public School Building Health... A Hidden Crisis! In addition to building new schools, we should also insure the health and safety of existing public schools. Sadly, our state faces a school repair backlog that exceeds more than $10 billion and is certain to be endangering the health of our students. Nearly all buildings are subject to building codes which are regulations intended to insure the safety of occupants. Building codes are revised about every three years. The only buildings exempt from these rules are public schools. In order to keep the construction and repair cost of school buildings down, safety codes for public schools have not been revised in nearly 40 years (since 1971). This means that the buildings school children are required to spend their days in are the least safe buildings in our State. 3. Protection from pathogens such as mold and mildew. 4. Structural Soundness to Remain Standing in the Event of a Major Earthquake. Responding to concerns and complaints from parents and teachers, there have been several attempts to address these problem, both legislatively and from the Washington State Department of Health. In 2005, Representatives Chase, Kenney, Santos and Hasagawa introduced House Bill 2177 requiring the testing of toxic mold in schools. The bill never even got a hearing. Also in 2005, Senators Jacobsen, Rockefeller, Kohl-Wells, Kline, Franklin and Edie Introduced Senate Bill 5029 which would requiring Safe Drinking Water in Schools There was also a companion bill in the House (HB 1123) on Safe Drinking water in schools sponsored by Representatives Kenney, Dickerson, McIntire, Morrell, Santos, Cody, Upthegrove, Hasegawa, Moeller, Kagi, Ormsby, Chase, Williams, O'Brien, Green, Sullivan, Sells, Wallace, and McDermott. This bill was never brought up for a vote. Recognizing the lack of support for improving school building safety in the legislature, proponents have also tried to get these safety issues addressed administratively through the Washington State Board of Health by updating the School environmental health (EH) rule, chapter 246-366 WAC (CR 102). Several hearings on the proposed rule update have been held during the past 10 years generally with parents and teachers asking for better air and water quality monitoring while legislators are generally opposed due to concerns about the cost of making schools healthier. These hearings were held by the Board of Health’s Environmental Health (EH) Committee. During public hearings in 2008, one parent described their child coming home with extreme fatigue, vocabulary loss, headache, bellyaches, and dizziness. Drinking water in her classroom was later found to contain elevated levels of lead. Another parent said her son would complain of terrible stomach pains before dinner every night. She later found out his school had high concentrations of copper in its drinking water. Lead exposure in childhood is known to result in reduced brain size, increased aggression, and a greater likelihood of criminality as a teen and adult. The Department of Health estimates that 30% of schools in Washington have drinking water levels that exceed 20 PPBB for lead. This problem occurs mainly in older crumbling schools that are also structurally unsound. It has been estimated that improving indoor air quality would reduce asthma rates by 20% saving our State more than $2 billion a year in health costs as well as greatly improve academic performance. In April, 2009, House Bill 2334 was offered by Representatives Dunshee, Williams, Hunt, Ormsby, White, Conway, Hudgins and Chase which would provide $3 billion in school construction and repair bonds. A portion of these funds were intended to cure health problems in our public schools. Those who voted against House Bill 2334 (in committee) included Representatives Warnick, Pearson, Anderson, Hope, McCune and Smith. The Bill eventually died in the Rules Committee and was never brought up for a full vote in the House of Representatives. It is amazing that anyone could vote against a bill essential for protecting the health and safety of school children. On June 10, 2009, the EH Committee wrote a letter stating that despite making many compromises to reduce the cost, the 2009 legislature included a clause in the final 2009-11 operating budget, passed April 2009 as ESHB 12444, in Section 222 prohibiting the State Department of Health from implementing any new or amended school facility rules without approval of the legislature. It is known that due to the failure to maintain our public schools, many schools suffer from extreme toxic problems that may cause health problems in sensitive children. Given the rapid rise in asthma, allergies, leukemia, and other severe childhood health concerns, the failure to permit the revision of school health standards, essentially raising them up to the standards already existing for other buildings, is very troubling. When we add the $10 billion school health problem to the $23 billion school construction backlog, the total school construction and repair backlog appears to be over $30 billion. However, this does not include the biggest cost of all – rebuilding over half of our dangerous 50 year old schools to prepare for the next major earthquake. This will cost more than $28 billion. However, since it is the older schools that suffer from both health problems and structural problems, the total bill to upgrade every school in our state to the current building and health codes is about $50 billion. 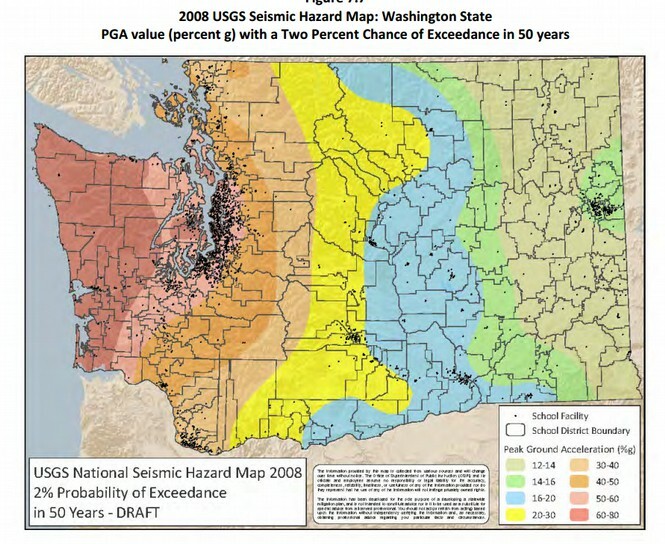 Since an 8.0 earthquake if ten times worse than a 7.0 quake and a 9.0 quake is 10 times worse than a 8.0 quake, a 9.0 megaquake is 160 times worse than anything we have ever experienced here in Washington state. The coming megaquake could kill thousands of people and cost billions of dollars. Power, food and water supplies could be out for more than one months. Half of all bridges, half of all buildings, half of all schools and half of all homes may be damaged – especially bridges, buildings, schools and homes that are more than 40 years old. Before dismissing this danger as just one of many threats that will never really happen, here is the pattern of Class 9 Cascadia induced megaquakes in the Pacific Northwest for the past 4,500 years. As you can see, at more than 315 years of quiet, we are already in the longest period of quiet between megaquakes during the past 1500 years. The last time there was this long of a quiet spell was in 200 AD to 500 AD. This last long quiet period between 200 AD and 500 AD was followed by two 9.0 quakes and one 8.0 quake in just 200 years between 500 AD and 700 AD. These megaquakes are all caused by a build up of pressure in the Cascadia Fault. The longer times goes on between faults, the more the pressure builds up and the worse the megaquake becomes when it finally does occur. It is therefore likely that the amount of pressure built up currently is similar to the pressure built up in the previous quiet period. If this were a mathematical probability puzzle, the best guess for the next quake would be sometime between 1900 AD and 2000 AD. So we are already past the most likely time for another earthquake in the 8.0 to 9.0 range. This delay increases the likelihood that the next quake will be a 9.0 quake. 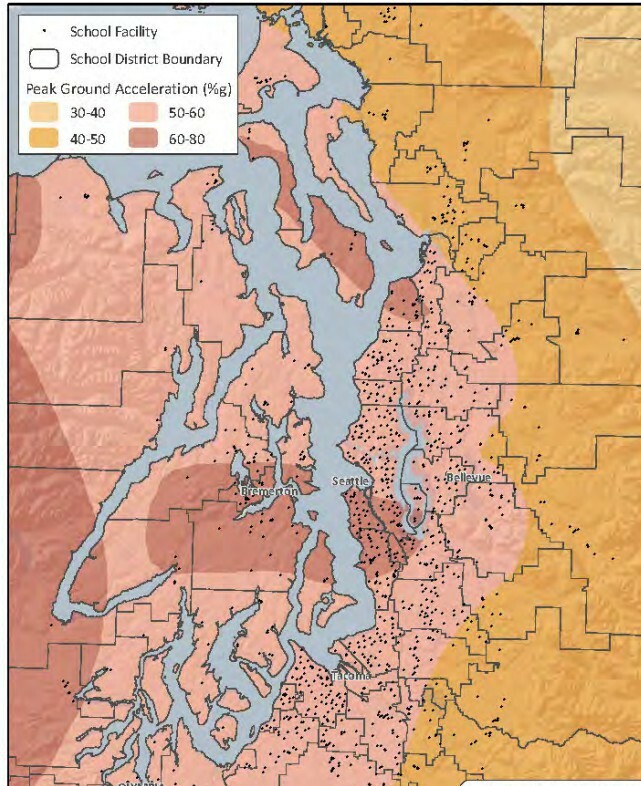 From a math probability standpoint, a 9.0 mega quake is likely to occur in the Pacific Northwest in the next 50 to 100 years – and could happen anytime since it is already passed due. A more interesting question is why the megaquake has not happened already. 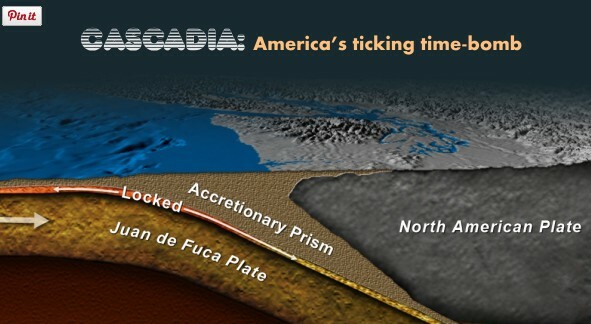 Some have claimed that the Cascadia fault is “stuck” or “locked” on something. Once it releases, there will be a huge mega quake. Every year that goes by simply increases the pressure and force of the quake when it does occur. What will happen when the Megaquake does occur? The reason that power will be out for so long is that communications can not be restored until power is restored. Food and gas supplies also require power and roads. Banking also requires power. But power cannot be restored until roads and bridges are restored. But how can we restore roads and bridges without power? The answer is that rescue and repair people would have to start at Spokane and start repairing power and roads and bridges working their way westward to the Puget Sound region. Crazy as this sounds, this is actually the plan. Schools are among the most heavily used public buildings and one of a few classes of buildings whose occupants’ presence is compulsory. In 2010, the Western States Seismic Policy Council (WSSPC) adopted a policy recommendation that states, “Children have the right to be safe in school buildings during earthquakes” (WSSPC, 2010). OSPI says there are 4000 permanent school buildings and about 4000 portable buildings. Since half of these school buildings are at risk of collapsing, half of our one million students or 500,000 students are at risk of being killed or injured. Yet, the Washington legislature has done almost nothing to protect our public schools. Shelter including a place with food and water will be essential to insure the survival of those whose homes are destroyed by the mega quake. If half of the homes and apartments are destroyed, this will require emergency shelters in every community. The most common buildings on the lists of community emergency shelters are public schools capable of holding a large number of occupants. However, if half of the school buildings are also destroyed, many communities will be left without any emergency shelters just when these shelters are most needed. What would it cost to relocate and replace schools for 500,000 students? This is actually relatively easy to calculate. We have previously determined that it would cost about $5.6 billion to build 167 schools for 100,000 unhoused students (replacing more than 500 portable classrooms). Therefore, it would cost about $28 billion to relocate and rebuild about 1,000 schools for 500,000 students. 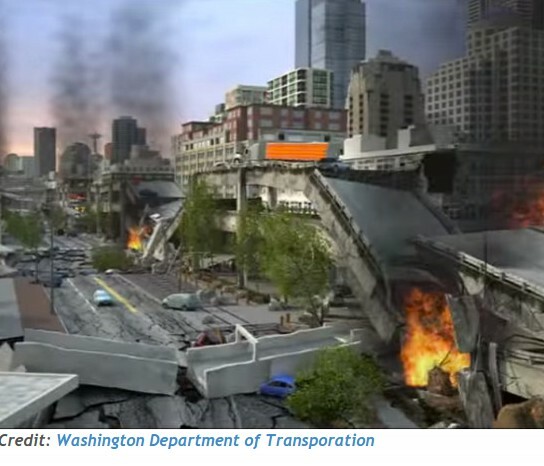 The entire building program would mean that Washington state would have at least 3,000 modern earthquake proof schools that could be used as Community Emergency Shelters in the aftermath of a Class 9 earthquake. All that would be needed besides these 2,000 buildings would be stockpiles of food and water for the entire community to last for 30 days until outside transportation and communications could be restored. Total School Construction budget for the next two years.......... $440 million per year. In fact, Senate Bill 6080 which supposedly provides the funding to built the classrooms needed to lower class sizes in Grades K-3 only provides $200 million during the next two years. Even this $200 million is an illusion because what the legislature really did was CUT $200 million from the previous biennium budget and then RESTORE $200 billion in this biennium budget and then claim they increased funding by $200 million when they only restored their previous budget cut. This is the kind of “smoke and mirrors” that the legislature is trying to put past the voters and the Supreme Court. To be more precise, from the 2011 biennium to 2013 biennium, school construction funding fell from $800 million per biennium to $600 million per biennium. Thus, $200 million was cut from the previous biennium's school construction budget. In the 2015 biennium, the legislature merely added back the $200 million they cut two years ago. Now they have the audacity to call it new funding! In the current two year period, they alloted $600 million for school construction and put the other $200 million in a special account for K3 class size reduction. This makes it look like the legislature did something when they really did not increase funding at all over their $400 million per year level of four years ago – a level that only funded 10% of actual school construction. 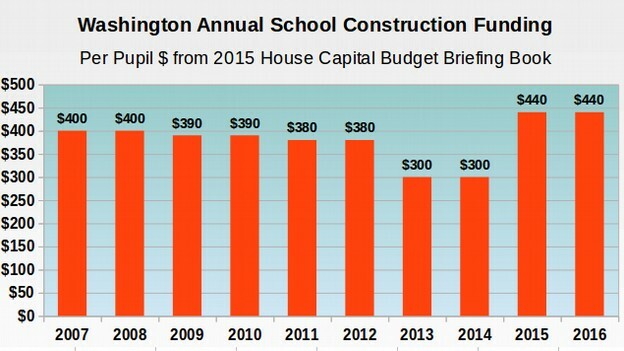 Here is a chart of Washington School Construction funding during the past 10 years. The $440 million per year for the 2015 and 2016 school years is much less than the $400 million for the 2007 and 2008 school years due to inflation. But more important, $400 million per year in 2007 and 2008 were only one tenth of what was actually needed due to the prior years school construction funding shortfalls. The school construction backlog was over $10 billion even in 2008 and it has gotten worse by more than two billion dollars every year since then. It is now nearly $24 billion! If $400 million per year only covers 10% of actual school construction, then the cost of 100% of actual school construction is $4 billion per year! $440 million per year is only a tiny fraction of what is actually needed. Subtracting the unused Cash Balance, the amount spent on school construction in the 2011 to 2013 biennium and the 2013 to 2015 biennium was less than $400 million. Does the State Constitution Require the State Legislature to Build Schools? It is absurd to contend that the drafters of our state constitution intended for the state to provide for a uniform system of public schools including paying for all of the teachers – but then not be responsible for paying for the classrooms required by those teachers to actually teach in. It is even more absurd to claim that the drafters of our constitution were aware of the drawbacks of over-reliance on local levies in terms of creating rich schools and poor schools – but then not be aware that over-reliance on local bonds would lead to exactly the same two-tier system of wealthy school districts that could pass local bonds and poor school districts that could not pass local bonds. Combine $5 billion per year in school construction costs with $5 billion per year in school operating costs and it is plain that the state legislature is underestimating the cost of fully funding school operation and construction by as much as $10 billion per year. Instead of funding schools, our current leaders give away billions of dollars per year in tax breaks to wealthy multinational corporations at the same time that they tell us there is not enough money to hire the teachers or build schools. As a consequence, our children are forced to endure some of the lowest funded and most over-crowded schools in the nation. 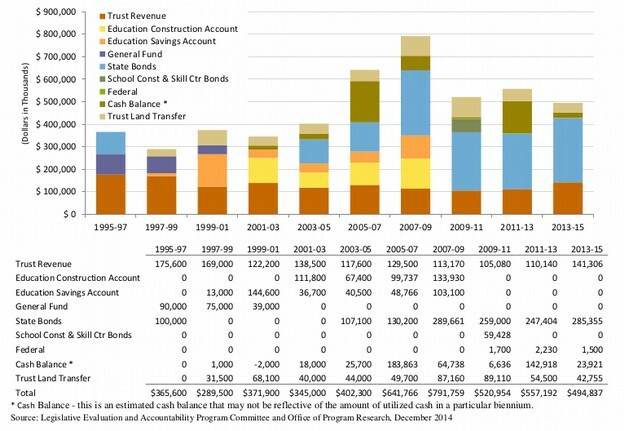 Total annual tax breaks are currently $30 billion per year. The largest of these tax breaks is the Intangible Property Tax Break – which is $5 to $6 billion per year. The Boeing and Microsoft Tax Breaks are also $1 billion per year. If we simply eliminate these three tax breaks, we would have an additional $7 to $8 billion per year. This could be divided into $5 billion per year to build schools and $2 to $3 billion to lower class sizes after more schools are built. 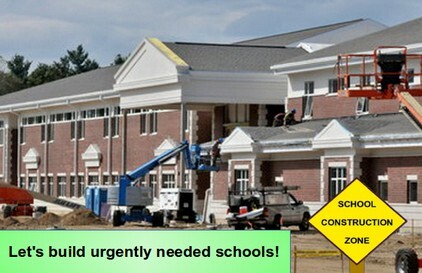 $5 billion per year would allow us to complete the entire $50 billion school construction project in the next 10 years. At 20,000 jobs per billion dollars, $5 billion per year devoted to school construction and hiring teachers would also allow us to create 100,000 school construction and teaching jobs. The good news is that a State Public Bank could leverage these funds so we could build more schools soon and then pay ourselves back over time. This is why there is a clause in Senate bill 6093 to provide a billion dollars per year to create a State Public Bank. As the bank builds its assets, just like the Bank of North Dakota, it will no longer need additional capital. Instead, the bank will be able to pay the tax payers income allowing us to reduce taxes and eliminate debt to private Wall Street banks just as they have done in North Dakota. The most shocking difference between the two States is the difference in outstanding long term debt on school construction projects. In North Dakota, school construction projects are pay as you go, meaning total capital debt is only $347 million. But in Washington State, the total school debt is $9.54 billion. This is 36 times higher than North Dakota. Even adjusting for the fact that Washington State has 10 times more students, the capital debt per student is 3.6 times higher in Washington State than in North Dakota. Clearly having their own public bank in North Dakota has resulted in much better capital funding and much lower capital costs for public school students in North Dakota. 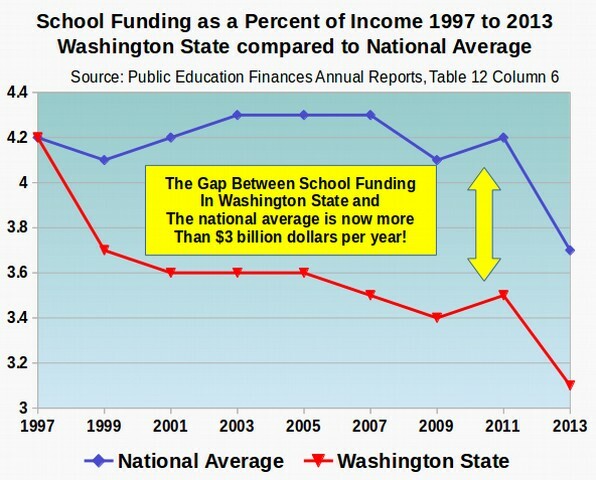 wasMeanwhile, Washington State schools are buried under a rising mountain of debt. Sadly, because of a massive school construction backlog, the long term debt situation is going to get much worse. Still, the most important reason to support Senate Bill 6093 is this: if we do not immediately begin replacing our older crumbling schools, when the next mega earthquake strikes, it will collapse as many as half of all schools – causing injury or death to 500,000 innocent children as well as about 30,000 teachers. David Spring M. Ed. & Elizabeth Hanson, M. Ed.